I’ve been thinking a lot lately about what I make and having a handmade wardrobe. 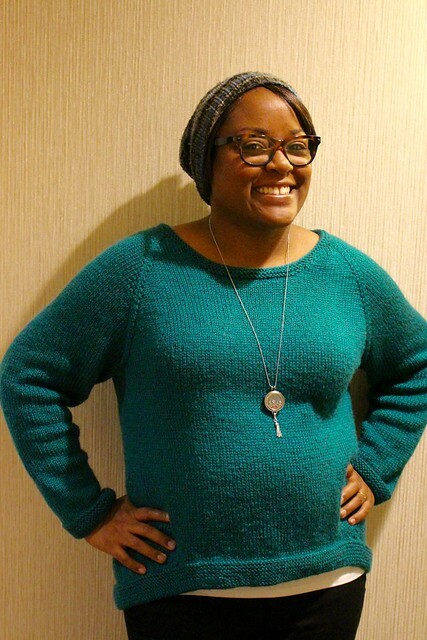 I made a small goal that eventually I will have a wardrobe filled with sweaters I’ve made instead of bought and I kind of love that idea the more I knit. 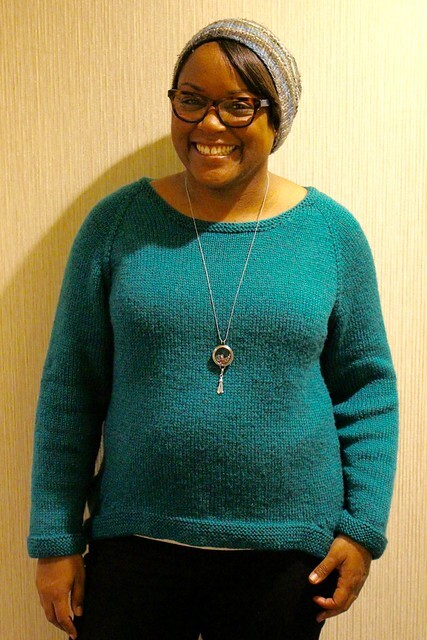 I wore only handknits in Chicago and I was filled with such pride and getting dressed was fun! I’ve even been wanting to dust off my sewing machine and maybe make a skirt or an a line dress for summer (I’m a much better knitter than a sewer though so I only sew basics). So as I’ve been thinking about what I love to wear (cardigans) and things I need in my closet, I decided that my next sweater I was going to knit was going to have to be in the sweatshirt family. This is my Lila Top Down sweater better known as the greatest sweatshirt I’ve ever made. 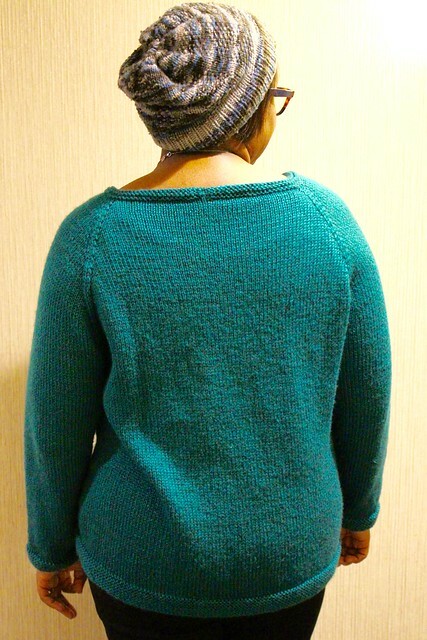 I knew when I made my Mountain High sweater that I wanted to use the Lion Brand Heartland yarn again. It is an acrylic but it’s light, super soft and washes and dries beautifully. I picked up this gorgeous heathered teal on a black Friday sale and decided that the Lila Top Down was the perfect piece to make with this. A little longer in the back if I want to wear with leggings and not too fitted making it easy to throw on over a tank or tshirt on the weekend. Despite having done set-in sleeved sweaters now, I still love a good top down sweater. I can try it on as I go to determine the length and fit. To me it’s just an easy sweater to construct. This pattern called for Sunday short rows and I didn’t even care to try to learn a new technique so I just did my beloved German short rows and called it a day. I was also filled with pride when out over the weekend with girlfriends I hadn’t seen in forever, one asked me the last thing I knit. I told her it was this sweater that I was wearing and they all grabbed the sweater and couldn’t believe I had made it. So when you wear a handmade that doesn’t look handmade, I consider that winning! I’m also looking at all my easy patterns that I can just make short sleeved and knit with cotton blend yarns for summer. You may see this or another Mountain High for spring! So what’s your favorite sweater style? And do you have any knitting goals like I do? HAHAHA isn’t that always the case? I have the yarn, know the project and then I get distracted by some other fantastic pattern! LOL And I really do like Madder patterns. They’re simple and clear and very classic. Love! I’m looking at the Liv cardigan now. One of my friends just sent me a link to this pattern — it must be fate. LOLOL! Yours look great! Well I’m still waiting on your progress on your sweater! I’m hoping someone else will share my sweater knitting addiction.